Until now the principal reason Russian businessmen ran for election to parliament was to secure legislator’s immunity from criminal prosecution. Lobbying their business interests into legislation, or drawing money out of the federal budget into their company projects and pockets, didn’t require getting elected or taking a parliamentary seat. Mikhail Prokhorov’s shareholding partner in the goldminer, Polyus Gold – the largest of the cash-generative companies Prokhorov currently controls – is one such. Suleiman Kerimov, a deputy in the State Duma between 1999 and 2007, and a senator in the Federation Council since then, has produced no record of a public speech, legislative act, public meeting with voters, or answers to the questions of the political press. His attendance record at parliamentary sessions is not disclosed when his office at the Federation Council is asked for it. His preferred spokesman is a lawyer in New York. 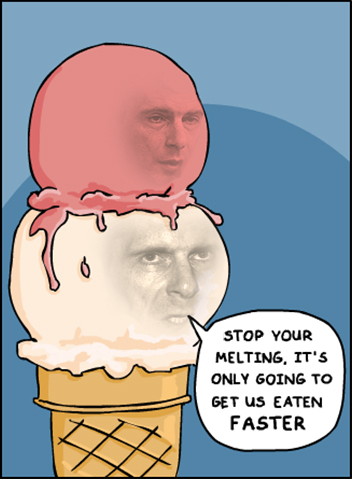 When Prokhorov was Vladimir Potanin’s shareholding partner in the running of Norilsk Nickel and the spinoff of its gold assets, there was a private agreement between them, according to associates they shared, that as far as government relations went Prokhorov would stay in the background; Potanin would handle the politics. Since the breakup of their partnership in 2007, Prokhorov has been in politics on his own. Secret meetings with politicians may signal influence, but the fact that they are kept secret is telling. The ratio of wealth to influence is smaller in Prokhorov’s case than his oligarch peers, except perhaps for Kerimov, Iskander Makhmudov, the copper and coal magnate; and Dmitry Pumyansky, the pipemaker. If publicly recorded meetings with the head of state and head of government are a reliable indicator of an individual’s political clout in Russia, then Prokhorov has almost none. The website of Prime Minister Vladimir Putin indicates no one-on-one meeting over the past two years. Their contacts have been limited to group sessions, and a photo-opportunity associated with one of Prokhorov’s businesses, the Yo-mobile. 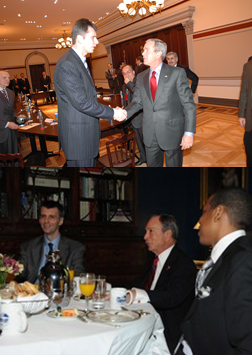 By this measure of political prominence, Prokhorov has done much better with US politicians – in Washington with President Gerorge Bush and in New York with Mayor Michael Bloomberg. His relationship with the Bloomberg media has been a love affair, whose passion has yet to be shared by the Russian press. Two Russian journalists have tried to set Prokhorov’s record straight after he was ousted from the Right Cause party last week. According to her published commentary, Yulia Latynina, who works for Novaya Gazeta, thinks Prokhorov agreed to run Right Cause and invest in its campaign for the December Duma elections because he “thought he was making a standard deal with the Kremlin.” The standard in Prokhorov’s dealmaking always obliges the counterparty to share the profit, and if there is more one party in the deal, Prokhorov usually insists on making his share the largest. Latynina doesn’t claim to know what Prokhorov’s take was expected to be from the Right Cause venture. On the contrary, she reports that it was wrong for the counterparties she identifies, such as Vladislav Surkov, the Kremlin political director, to insist on their share in the deal. Latynina in print: “When Surkov’s flunkies tried to exploit Prokhorov for their own political ends, he told them just where they could go…The problem for the Kremlin flunkies is that Prokhorov is not the type of man that you can walk all over. He is not some milquetoast bureaucrat who they can shove around. After all, Prokhorov is the guy who kicked out the Soviet-era directors and corrupt trade unions that were gumming up the works at Norilsk Nickel.” That sounds like the rationalization businessmen adopt when they fall out with each over money. It also appears to make the loans-for-share deal in which Prokhorov took over Norilsk Nickel (with Potanin) in 1995-96, at no outlay of his own, something like a political revolution. In response to a direct question, Latynina says Prokhorov’s party pitch had little to do with politics, and everything to do with the money shot. Take for example Latynina’s journalist colleague, Olga Romanova. In print Latynina has reported that “Prokhorov personally called up prominent journalist Olga Romanova and invited her to accept a top position in the party. Romanova went to meet with one of his public relations representatives to discuss the terms. After Romanova, who is one of Russia’s most prominent journalists, showed up for the meeting, a Prokhorov lackey greeted her with coffee and invited her to sit in a large, comfortable chair. He then politely said, “May I ask what brings you here?” The recruitment ended badly and Romanova walked out, Laynina concludes, because the Right Cause apparatchik didn’t recognize who she was, and hadn’t been told by Prokhorov in advance what sort of welcome to turn on for her. Latynina makes a different point when asked to explain what Romanova hoped to get from her deal with Prokhorov. Was it money? “No, this is wrong. Olga Romanova’s condition for participation in the project was the release of her husband, businessman [Alexei] Kozlov, from prison. Yesterday he was released for unrelated reasons. Prokhorov, of course, didn’t offer money to the people he personally invited to take place in the party lists. The Kozlov case has been reported publicly since Romanova’s husband was arrested in 2008 on charges of stealing shares worth Rb250 million ($8.3 million) from his former partner, then Senator Vladimir Slutsker. Kozlov claims innocence and charges Slutsker with setting him up and abusing the legal process. He was convicted in 2009 of fraud and money laundering and sentenced to eight years in prison. In July of this year, a higher appeals court overturned the verdict and sent the case back for retrial. Kozlov’s release from prison and into house arrest followed on September 20. In his brief campaign Prokhorov’s interest in human rights has been restricted to proposals to increase the labour time of Russian workers.